Beer Bear Shirt- Funny Beer Bear Shirt looks so cool! 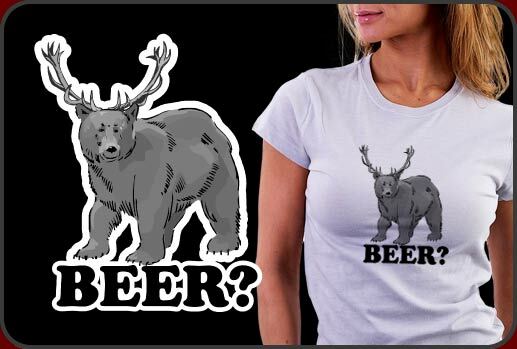 Hilarious Beer Bear Shirt raises the question of animal cloning experiments to produce delicious beverage! So you take half a tsp. of bear DNA and mix it with a half tsp. of deer DNA and you get...BEER! We have found the answer to the worlds problems! Rejoice and let the cloning begin! Our Beer Bear Shirt is a great funny shirt to wear out to the pub for drinks with your friends or really just anywhere. Beer fans really love our beer bear shirts. Very funny Beer Bear t-shirt that prints nice on any color or style t-shirt we offer.